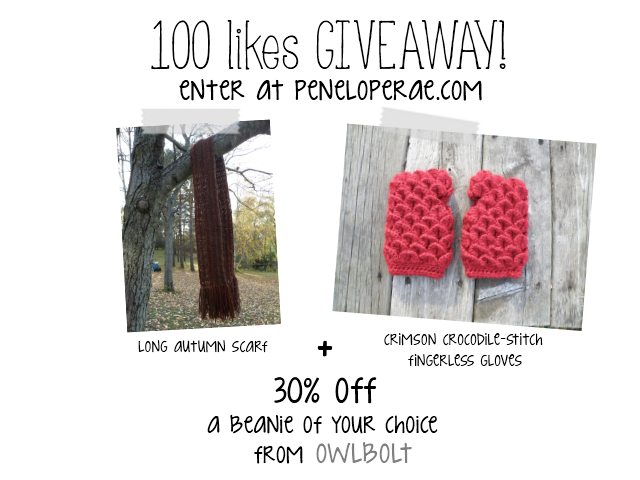 Penelope Rae: 100 Likes GIVEAWAY! As promised, I am now hosting a giveaway to celebrate my new shop name and my first 100 likes on facebook! There will be 3 winners chosen on Monday, November 5th. Prize 1 is a long crocheted autumn scarf, prize 2 is crimson crocodile-stitch fingerless gloves, and prize 3 is 30% off of a beanie of your choice from owlbolt.etsy.com! Penelope Rae crochet and knit patterns by Carrissa Knox is licensed under a Creative Commons Attribution-NoDerivs 3.0 Unported License.